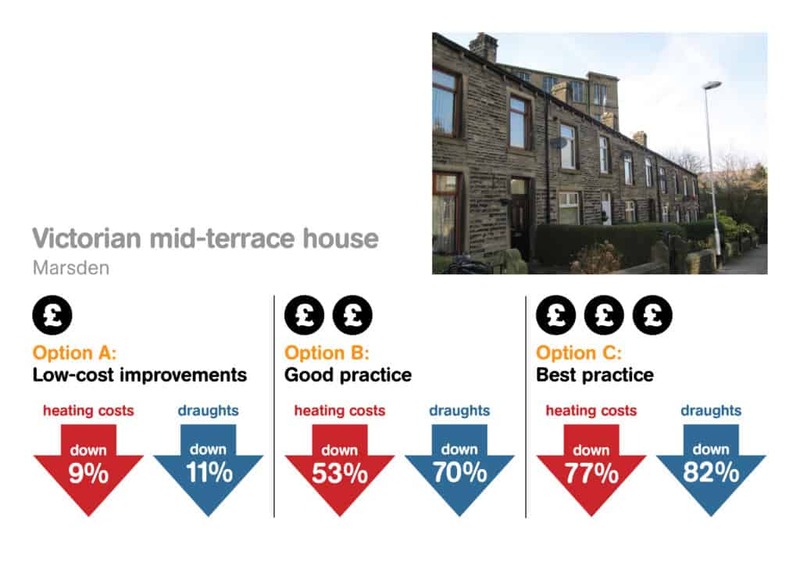 Our Warmer Homes research, undertaken with Connect Housing and Marsden & Slaithwaite Transition Towns in 2012, put forward three refurbishment options for two typical West Yorkshire homes. Which route you decide to go down will probably be largely dependent on budget but once you choose one option it may be difficult to later change to the alternative option. Many of the actions presented in each option can be broken down into smaller, more manageable and affordable steps, as part of a ‘whole house plan’. 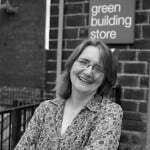 The research for the options was undertaken by Green Building Store using Passivhaus Planning Package software (PHPP). 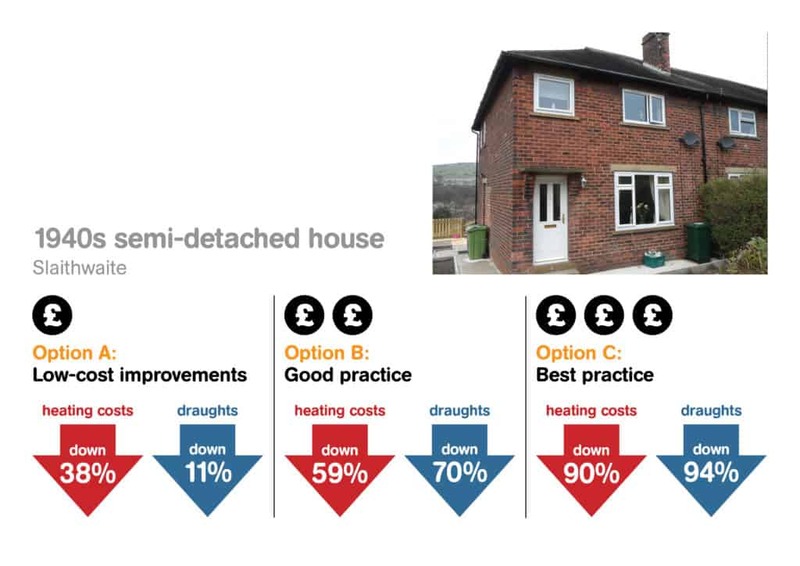 Airtightness figures to help with the modelling were a mixture of actual figures from tested properties and estimates of likely improvements. Typical 3-bed terraced Victorian stone and brick house of 66m2, with minimal loft insulation (100mm) and older double glazed windows. No potential for insulation in cavity wall or externally, due to construction type. Typical 3-bed semi-detached brick house of 80m2, with minimal loft insulation (100mm) and older double glazed windows. Has the potential for cavity wall and external wall insulation. Because it has more exposed walls, it is less efficient than the mid-terrace. Please download the Warmer Homes technical briefing for full details of the measures proposed for each building type. Would it make sense to improve the windows as part of the retrofit? If the windows & doors in the property needed replacing anyway (eg if frames are rotting or degrading or the glazing is steaming up), then it would make sense to replace windows with the most efficient windows & doors you can (looking out for low U values). Windows & doors should last at least 30+ years in a building, so it makes sense to upgrade to the most efficient you can, as the rest of the house will hopefully later catch up. If you are planning future wall insulation measures as part of your whole house plan, you will just need to think ahead as to the best position for the windows to be installed. A U value is a measure of how much heat is transferred through a particular section of construction – eg wall, window. The lower the U value the better the insulating effect and the better it will keep heat inside a building on a cold day.